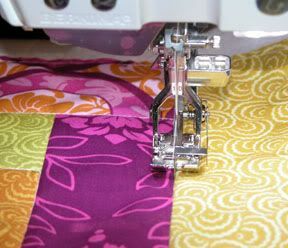 This means to sew (at least in quilting) on the seam, and requires the two pieces of fabric that meet at that seam to be pressed to one side beforehand. If you fold each piece of fabric back on itself, Stitch-in-the-Ditch will not work. Image taken from the Bernina Blog. This page has been seen 959 times. An automated review of this page attempts to determine its readability in English (US). The page contains roughly 51 words across 4 sentences.